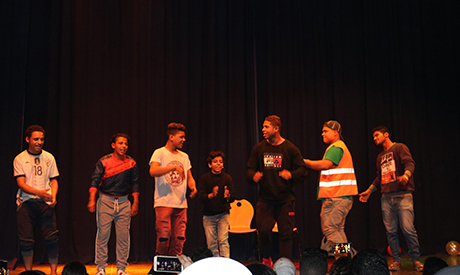 Under the sponsorship of French nonprofit association Samusocial International Egypte, dozens of street children and young people showed their talents in the arts at the Performing Arts Forum for Children at Risk event held at the French Institute in Cairo on Saturday. Many art activities were performed by the children and youth, including theatre shows, dancing performances and an art exhibition. The day-long programme has garnered praise from representatives of the European Union, the French Development Agency, the Netherlands embassy, the French Cultural Centre and a number of well-known artists including Tunisian movie star Dorra Zarrouk. "I came here to see you. I am very surprised by all the talent and positive energy I saw today," said the 38-year-old actress, who has starred in a number of Egyptian movies. The first show was a play called 'Kite' performed by around 14 participants of the 'Art and Life' initiative for children at risk from the Caritas and Freedom associations in Alexandria. The play is a product of one-year-long workshops of a group of education and arts specialist volunteers, written by Caroline Kamal and Rafat Bayoumi, and directed by Bayoumi. The programme also included director Mohamed Abdullah's 15-minute mime show 'Techno', the product of a workshop with the children from the ‘House of Girls Agouza,’ under guidance of the Ministry of Social Solidarity in collaboration with the mime unit group. A 15-minute theatre puppet show, 'The Strange Flower', was also performed. The show was the product of a workshop for manufacturing puppets and a storytelling workshop with the children from Ana Al-Masri Foundation, directed by Sarah Al-Batrawi. Three contemporary dance shows were also introduced; Nermin Habib's Amwaj by Banati Foundation, Abdel-Rahim Mohamed's Tahadi by Ana Al-Masry Foundation and Ibrahim Abdu's Independent Personality of The House of Girls Agouza. The play 'Green Light', directed by Sharif Al-Qazzaz, was the ending show of the programme, featuring kids showing their talents in acting and dancing. On the sidelines of the forum, the painting exhibition Colors of the Street, under the guidance of artist Shindy Mohamed, introduced visual arts talents of the children and youth in street situations. 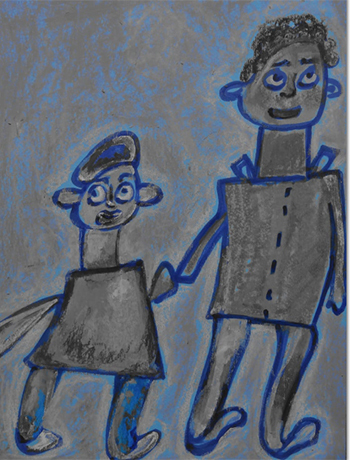 "I asked the children simple questions about their suffering in the streets and asked them to respond with paintings, and they showed great talent and deep emotions," Shindy told Ahram Online. The project is funded by the European Union, the French Development Agency and the Netherlands Embassy. Founded in 1998, Samusocial International aims to support and develop services to reduce the phenomenon of growing social exclusion in major cities and promote the rights of vulnerable groups as well as improve access to quality services for marginalised people. The foundation opened its office in Cairo in 2008, focusing on children and youth in street situations. Decades ago, Egypt's shelters and orphanages were a source of great artists, especially in the field of music, including Abdel-Halim Hafez, probably the most successful singer in Egyptian history.